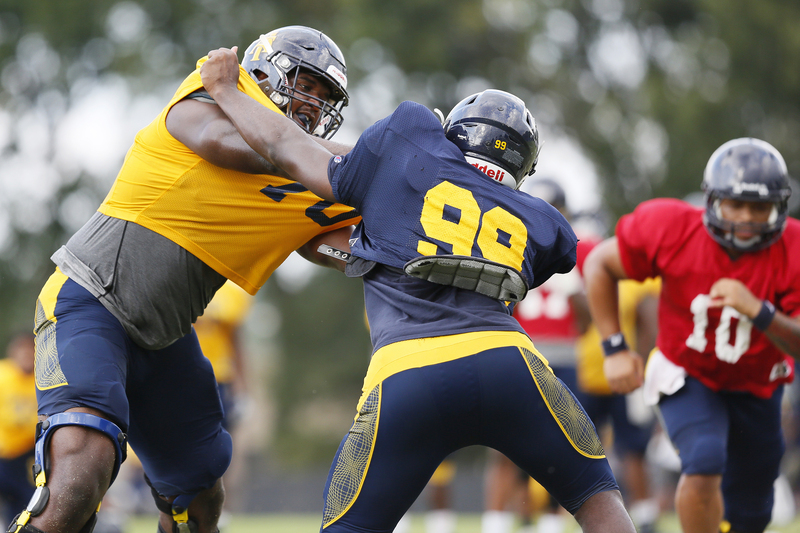 There are not many 6-foot-8, 310-pound people who can say they have been “overlooked.” But N.C. A&T State University left tackle Brandon Parker actually had to step out of the shadows to find his spotlight. Offensive linemen like Parker very rarely gain the same fame as players in such star positions as quarterback, running back or wide receiver. However, that hasn’t stopped Parker from becoming a force on the field — without a single full-time scholarship offer from an FBS school. Don’t be surprised if this two-time Mid-Eastern Athletic Conference (MEAC) Offensive Lineman of the Year is one of the first players from a historically black college or university (HBCU) selected in the 2018 NFL draft. Parker is also on the Walter Payton Award Watch List, the listing of the top offensive players in FCS football. In his hometown of Kannapolis, North Carolina, Parker, 22, played high school football with a future University of Virginia recruit, a future record-breaking running back at the University of North Carolina-Charlotte and a stellar quarterback. However, as any football fan knows, despite the talent at the skill positions, there would be minimal success without a strong offensive line. He’ll look to continue his stellar career on Saturday, when the Aggies celebrate The Greatest Homecoming on Earth, known as GHOE, Parker’s final homecoming against Delaware State. North Carolina A&T offensive lineman Brandon Parker (No. 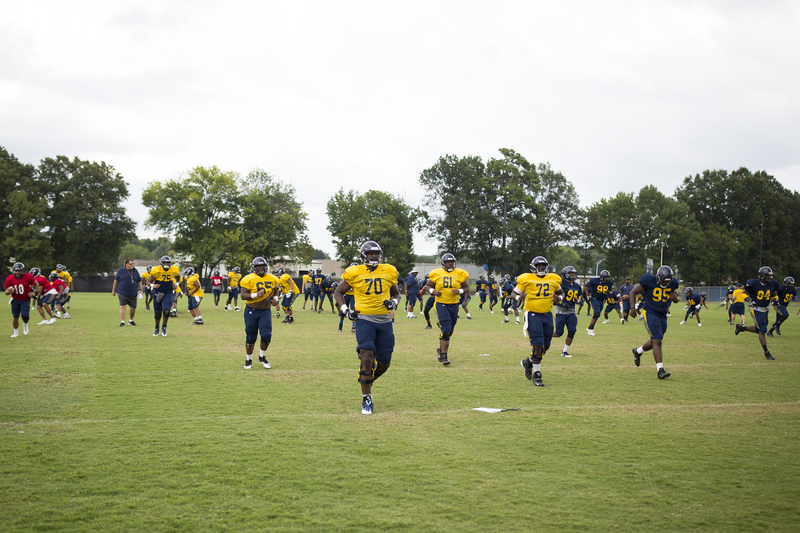 70) warms up during practice near Aggie Stadium in Greensboro, North Carolina, on Aug. 24. Aggies wide receiver Malik Wilson echoed that Parker is critical to the team’s offense. Parker has embraced the importance of his behind-the-scenes role in an offense. He chose A&T after receiving offers to play football from other FCS schools such as North Carolina Central University and Winston-Salem State University. The main reason he took his talents from Kannapolis to Greensboro was his sister, Jasmine Parker. She played for the school’s basketball team at the time. Brandon Parker (left) blocks defensive lineman Artavious Richardson as they run drills during practice near Aggie Stadium in Greensboro, North Carolina, on Aug. 24. In the four years that followed, Parker became an electrical engineering major. He also helped his football team to a MEAC championship in 2015, a Celebration Bowl championship in 2015 and two black college football All-American selections. Now, in his senior year, Parker and the Aggies are currently undefeated in the MEAC. North Carolina A&T offensive line coach Ron Mattes says Parker’s legacy as an Aggie will be rivaled by few and he believes Parker has all the tools to be successful at the next level. Parker attributes his skills and successes to his supportive family. After all, he grew up in a dedicated sports family. His mother, Regina Parker, played basketball for the University of North Carolina as a walk-on. His father, George Curtis Parker III, earned a football scholarship to the University of North Carolina as a left tackle. It was no surprise that Parker embraced athletics at an early age. 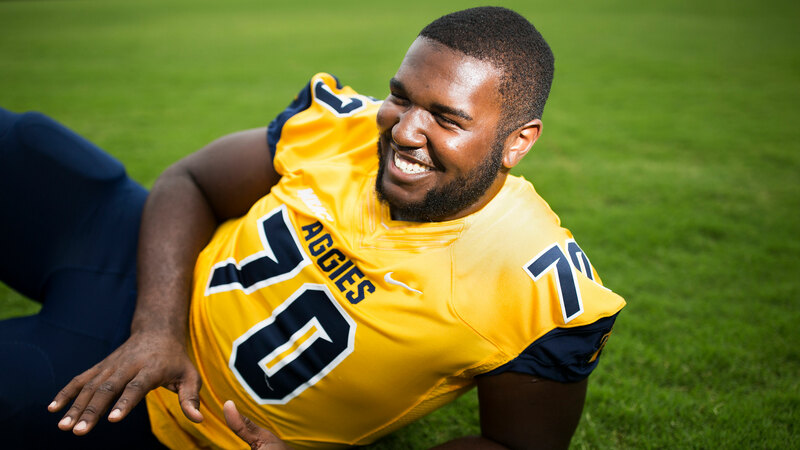 Offensive lineman Brandon Parker poses for a photograph on the field of Aggie Stadium at North Carolina A&T in Greensboro, North Carolina, on Aug. 24. He credits his father as the main influence in pushing him to become the player and person he is today. Parker’s dad coached football for years and shared blocking techniques and other tips with his son. Parker, on the other hand, recalls being nagged repeatedly about improving his coordination by jumping rope. Years later, Parker acknowledges that he was just being “boneheaded” (his term for stubborn). Once he actually followed his father’s advice, he saw a significant improvement in his agility and footwork. Since joining the Aggies, Parker has come a long way from the overlooked, self-proclaimed “big kid on the block” from Kannapolis. He traded in “boneheaded” to become one of the best offensive linemen in the MEAC and one of the top HBCU prospects in the 2018 NFL draft. While he is excited about both his legacy and his future, Parker is keeping his eye on the goals that are directly in front of him: getting the Aggies an outright MEAC championship, unlike the one they shared in 2015, and a trip to the Celebration Bowl. Donovan Dooley is a Rhoden Fellow and a multimedia journalism major from Tuscaloosa, AL. He attends North Carolina Agricultural & Technical University.